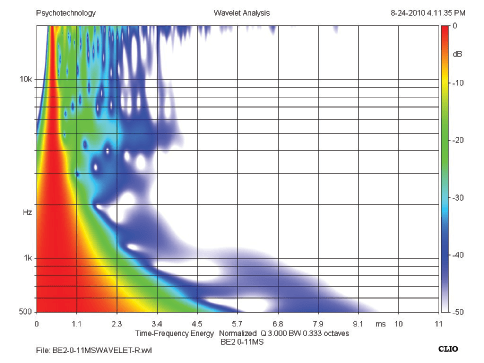 Understanding how beryllium’s unique qualities translate into better HF performance begins by looking closely at what’s happening inside a transducer during operation. A transducer is an extremely complex electromechanical ecosystem where the entire assembly is required to move very quickly, and in perfect synchronicity. Any deviation from the desired motion, or deformation due to stress can cause unwanted resonances or “breakups” that we hear as distortion. To better understand how breakup occurs, it’s helpful to examine it at the component level. A diaphragm, for example, should move in a perfect pistonic motion (like a piston), with all points moving in uniform and only in the desired direction. Breakup occurs when the forces acting upon the diaphragm overpower its structural integrity and different points on the surface begin moving in different times relative to one another. Because beryllium is extremely light and stiff, it does a better job of maintaining its structural integrity under load and avoiding these breakups. Even more critical, however, is the efficiency at which sound travels through beryllium. This is important because the frequency at which the first breakup occurs in any metal, is analogous to the speed of sound through that metal. The speed of sound through beryllium is nearly 2.5 times faster than that of aluminum or titanium. This means the first breakup will occur at a much higher frequency–well outside the audible range in most cases. What’s more, when breakup does occur, beryllium’s greater stiffness ultimately reduces the amount (amplitude) of those breakups. The remainder of this article will explore these exact qualities in greater detail. Evaluations will be conducted in three phases, comparing aluminum, beryllium and titanium in each phase. The first phase will use mathematical modeling to evaluate theoretical benefits of all three as a diaphragm material. The second will measure physical performance of individual domes through vibration testing, and the final phase involves actual acoustic analyses of a fully- assembled compression driver. It’s relatively easy using mathematical (Finite Element Analysis – FEA) modeling to evaluate a theoretical diaphragm’s motion. A finite element model was constructed using an identical, 100mm diaphragm geometry with the only variable being the material. This analysis intentionally ignores outside influences such as acoustical load, phase plug and horn geometry, in order to focus exclusively on the unique fidelity of each metal. In turn, the unique properties of aluminum, titanium and beryllium were fed into the model while the actual geometry of the theoretical diaphragm was unaltered. The first six bending (breakup) modes are shown in figure 1 and charted in figure 2. Figure 2: Charting resonant frequencies. All the results clearly show that while the breakup modes for each metal are somewhat similar, the beryllium diaphragm’s breakup occurs at a much higher frequency than the other two (approximately 2.5 times higher), thereby shifting resonant frequencies outside the audible range. Figure 1: The first six breakup modes. The Klippel SCN laser scanner used to measure vibration. 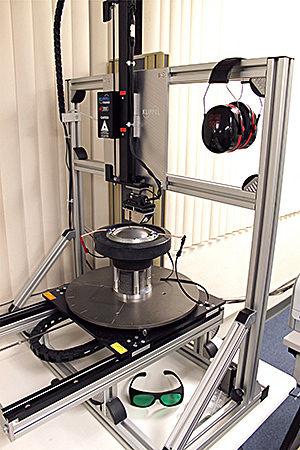 The vibrations of aluminum, titanium, and beryllium compression driver domes were measured using a Klippel SCN laser scanner. These geometric and vibration scans make it easier to see how the predicted results match the measured results in the next section. For simplicity, 2D (cross-section) measurements of each dome’s total vibration at four frequencies are presented. Beginning at 5kHz, relatively minor bending (breakup) occurs on all the domes. As the frequency goes up, bending waves become more visible. In looking at the cross sections (figure 3) it’s clear that the beryllium dome remains significantly more settled at high frequencies than the other two. measurements confirm this to be true and demonstrate beryllium’s inherent effectiveness at pushing breakup largely outside the audible range. Figure 3: Results of vibration testing. 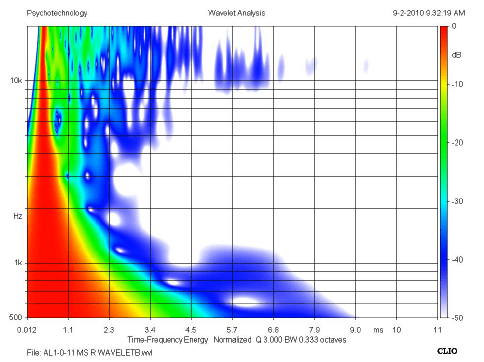 Figure 4: This chart presents similar data by simply counting the number of wavelengths up one side of each dome. These test are performed using actual diaphragm domes with best possible profile and thickness consistency between them (it’s impossible to achieve the same degree of consistency between physical components as with mathematically modeled components). The domes were mounted to the same compression driver motor assembly using a custom fixture that ensures repeatable position. To minimize the effects of different suspension methods, these scans were limited to a 51mm radius, 1mm outside the nominal voice coil radius. This restricts the measurements to only the metallic part of each dome. These measurements confirm the benefits of beryllium’s better pistonic behavior, high frequency response linearity, and distortion. The data shows the actual frequency response and harmonic distortion performance of four different diaphragms on the same motor assembly using a plane wave tube, which was selected to eliminate the effects that a specific horn would introduce. Aluminum was one of the first materials used for compression driver diaphragms because it’s both lightweight and relatively stiff. It’s also readily available and easy to form. 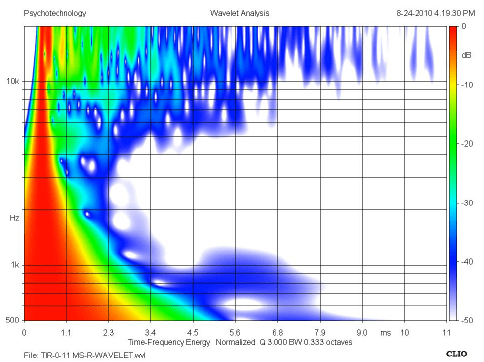 The plots confirm that aluminum exhibits good frequency response above 10kHz, while distortion is also good below 12k Hz. Aluminum does not perform as well in higher power applications due to its lower overall strength.The use of titanium gained popularity in recent decades due to its ruggedness and ability to provide higher output than aluminum. The tradeoff is the high frequency distortion shown here, which supports the common perception that titanium does not sound as good as aluminum. Ribbing of the titanium dome and diamond pleated surrounds are a popular method for adding stiffness, thus extending the high frequency response. The tradeoff is higher Q resonances, which create obvious non-linearities above 10kHz. As demonstrated by the vibration analysis, both the aluminum and titanium response/distortion plots exhibit sharp peaks and dips near 10k as a result of destructive interference with the dome’s in-phase motion. The beryllium diaphragm exhibits the best overall performance. It has a smooth, extended frequency response while distortion is comparable to the other materials below 10kHz. Above that mark, beryllium performs significantly better than the other two. To fully understand the impact of high frequency breakup modes and the associated frequency response “peaks” presented above, it’s helpful to also look at time domain behavior. This type of data has only become readily available in the last 15 years, and is increasingly used to qualify sound quality issues that could be heard but were previously impossible to measure. 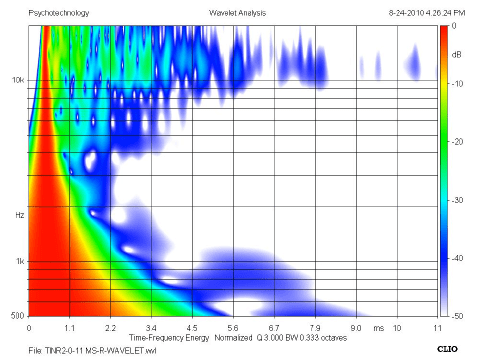 For reference, here is a perfect wavelet; the decay is approximately 1/f for each frequency. High frequency breakups result in a rough and “peaky” frequency response that typically results in a long decay in the time domain (commonly referred to as ringing). This effect is particularly evident in the top octave response and decay differences between the smooth, fast-decaying beryllium driver and the peaky, long-ringing ribbed titanium driver. The aluminum diaphragm has reasonably good decay behavior, both in the upper two octaves and at 1 kHz. The titanium diaphragm with no ribs is the second worst performer on the wavelet decay test. It suffers from the top octave and 1 kHz ring. The titanium ribbed diaphragm shows the worst ringing, exhibiting long decay at both the upper two octaves and at 1 kHz. 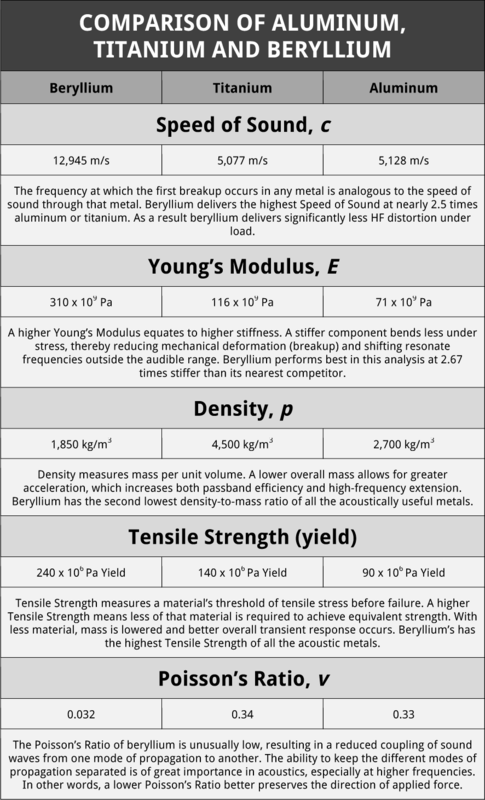 The beryllium diaphragm has the best top octave decay characteristics of the four materials and shapes. We can view both time and frequency response on the same graph using 3-dimensional cumulative spectral decay (waterfall) plots. Here, we can clearly see the break-up of the aluminum diaphragm (left) above 10kHz, with resonances clearly ringing out past 5ms (>3ms after the first arrival). The beryllium (right) remains very well-behaved throughout the top octave, and has no visible ringing after about 2.8ms (~1ms after the first arrival). There are still many opportunities to improve modern day transducer design, and thanks to the efforts of companies like Materion Electrofusion, the potential for once-esoteric technologies like beryllium to improve both performance and reliability is better than ever. Leveraging beryllium’s inherent advantages is the best and most immediate way to achieve a notable and measurable improvement in high- output, high-frequency loudspeaker performance. Most importantly, VUE Audiotechnik is committed to bringing these inherent benefits to a much broader market, while also exploring new applications for this exceptional metal throughout the entire loud- speaker ecosystem. Let VUE and Materion keep you up to date on how beryllium is improving loudspeaker performance by signing up for our email alerts. You can also “Like” us on Facebook, or follow us on Twitter.